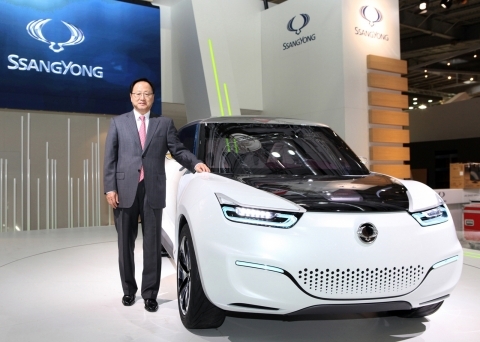 SEOUL--(Korea Newswire) September 27, 2012 -- Ssangyong Motor (President & CEO Lee Yoo-il; www.smotor.com), part of the US$15.4 billion Mahindra Group, today unveiled the company’s environmentally friendly and futuristic electric concept car, the e-XIV, at the 2012 Paris Motor Show. The company also launched the Rexton W SUV and petrol engine Korando crossover with automatic transmission to help boost sales in Europe. The Rexton W is a premium SUV that, boasts of outstanding performance from its durable powertrain which comprises an eco-friendly e-XDi200 active engine and Mercedes-Benz e-Tronic 5-speed automatic transmission. The new e-XDi200 active diesel engine not only enhances performance and reliability, but also ensures improved fuel efficiency and smoothness in all driving conditions. As a result, the Rexton W achieves 193g/km (6M/T, 2WD) of CO2 emissions, a 15 per cent improvement over the outgoing model, with maximum power of 155ps and maximum torque of 360Nm. Torque delivery is optimised throughout the most frequently used rev range – 1,500rpm to 2,800rpm - with low-end torque of 190Nm. The Rexton W offers a comprehensive range of safety features including a triple-layer steel frame and strong body, ESP (Electronic Stability Program), ARP (Active Roll-over Protection), TPMS (Tyre Pressure Monitoring System), and front & rear parking sensors. Other convenience features include eco cruise control, sliding headrests, easy access memory seat, USB to play MP3 & WMA files, and Bluetooth to enable safe use of mobile phone while driving. Sales of the Rexton W will begin shortly in Europe. 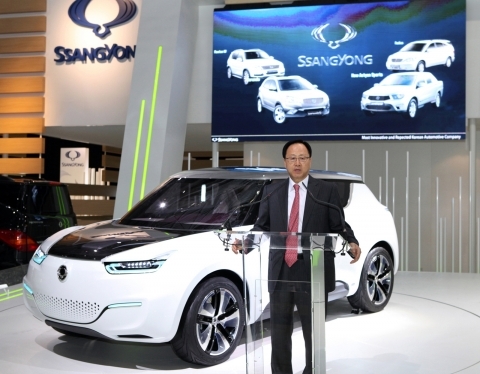 e-XIV conceptAs part of efforts to develop next-generation technologies and eco-friendly automobiles, Ssangyong Motor Company showcased the range extender concept e-XIV, which is expected to be a globally competitive model, that lays the groundwork for future growth. The e-XIV features a crossover design with a combination of SUV and sports coupé styling that is suitable for both active driving in the country and short distance motoring around the city. Ssangyong Motor Company first took the wraps off the new petrol powered Korando at the 2012 Geneva Motor Show, and at this year’s Paris Motor Show the company will introduce its petrol engine with automatic transmission. The launch of the 2.0-litre (149ps) petrol engine with automatic transmission provides even greater customer choice and completes the powertrain line-up for the stylish Korando SUV, which already includes a high-power diesel engine as well as a low CO2 version. Ssangyong’s engineers have also concentrated on reducing noise, vibration & harshness (NVH) levels with the addition of an acoustic engine cover which improves refinement and reduces noise levels inside the cabin. The petrol automatic version will arrive in European markets later this year.